Madronia Cemetery provides respectful and cost-effective interments to property owners and residents of the Saratoga Cemetery District (see map 2MB ), as well as to certain eligible family members and former residents. Those who lived or paid taxes in the district continuously for at least five years, part of which was in the last ten years, and who have a written request from a current resident that they be allowed to purchase interment rights. Staff will provide a sample letter upon request. Please be prepared to provide reasonable evidence of eligibility. A nonresident fee applies to anyone who is eligible but was not a resident or taxpayer of the district at the time of death. The amount of the nonresident fee varies depending upon resident status at the time of purchase of interment rights. We offer full-casket and cremation burial options, as well as niches for cremation inurnments. For an additional fee, a full-casket burial may be done “double-depth,” allowing room for a second burial in the same grave. We allow up to four cremation burials in a full size grave, and we have half-graves available for one or two cremation burials. Written permission is required for a grave to be shared. Sites are also available where memorial markers may be placed for persons not interred here. We do not have a mausoleum. 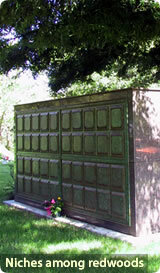 The cemetery sells the required vaults for both cremation and full-casket in-ground burials. We do not sell caskets or operate a funeral home or crematory, but we can provide referrals to local companies that offer such services. Burial costs can be paid “pre-need” to simplify matters during later, more difficult times, as well as to lock-in current prices. We do not charge extra, however, for “at-need” payments as some cemeteries do. Endowment fees are charged for all interment locations and placed in an Endowment Fund account to ensure that sufficient funds are available to maintain the cemetery grounds in perpetuity. Madronia Cemetery accepts donations for benches and trees in memory of loved ones. Benches may have memorial plaques or engravings.